"Old Lime Pit" lookout post in the south of Ireland. Glass plate negative showing an "Old Lime Pit" at Rathduff in County Cork. This was a sentry position overlooking a double railway. 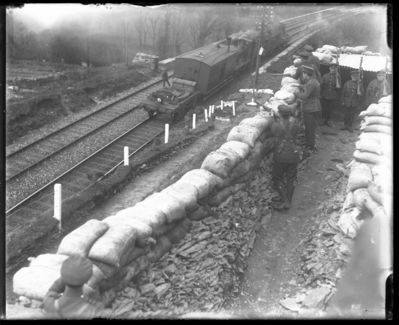 Six soldiers with Lee Enfield Rifles can be seen providing over-watch security for the train crossing the bridge at their location. An Officer can be seen overlooking the sentries ensuring they are providing adequate over-watch.For more information see An tÃ“glÃ¡ch Volume 1 No 5 (new Series) 21st April 1923.